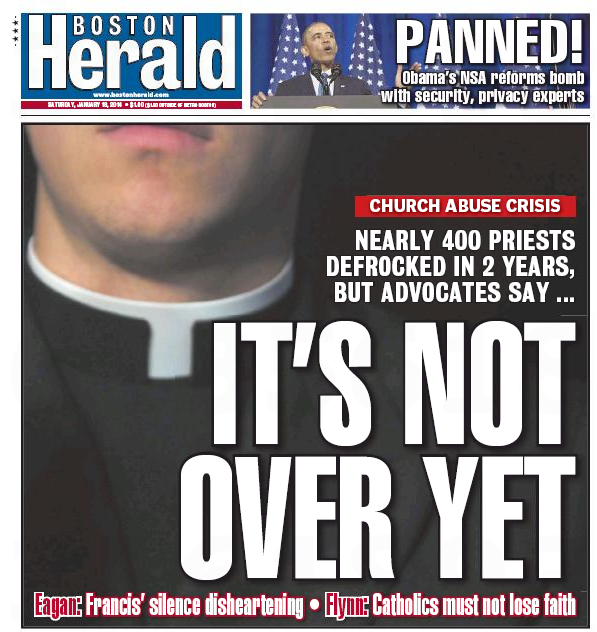 No question: Boston.com has had its troubles lately. Headlined “True Life: I Was a Bartender In Southie During the St. Paddy’s Day Parade,” the post was written by Boston.com wire staff writer Jamie Loftus, who wrote about her experience at a South Boston restaurant during Sunday’s St. Patrick’s Day parade. 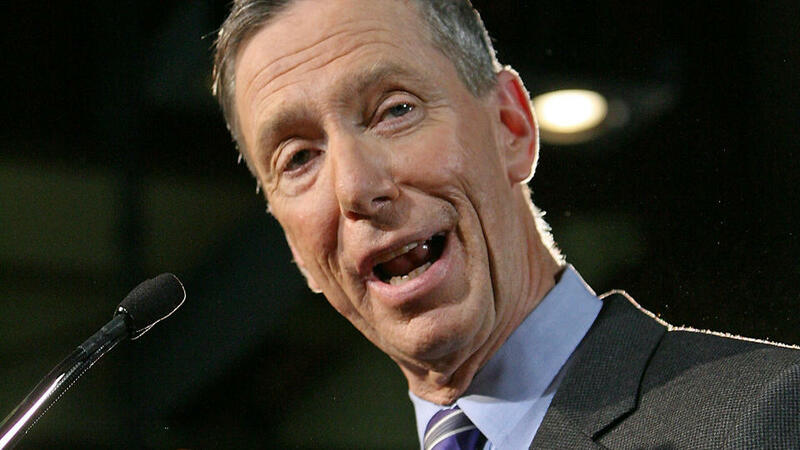 Money quote: “I’m surprised such bigoted views are still tolerated at Boston.com,” said U.S. Rep. Stephen Lynch (D-South Boston). 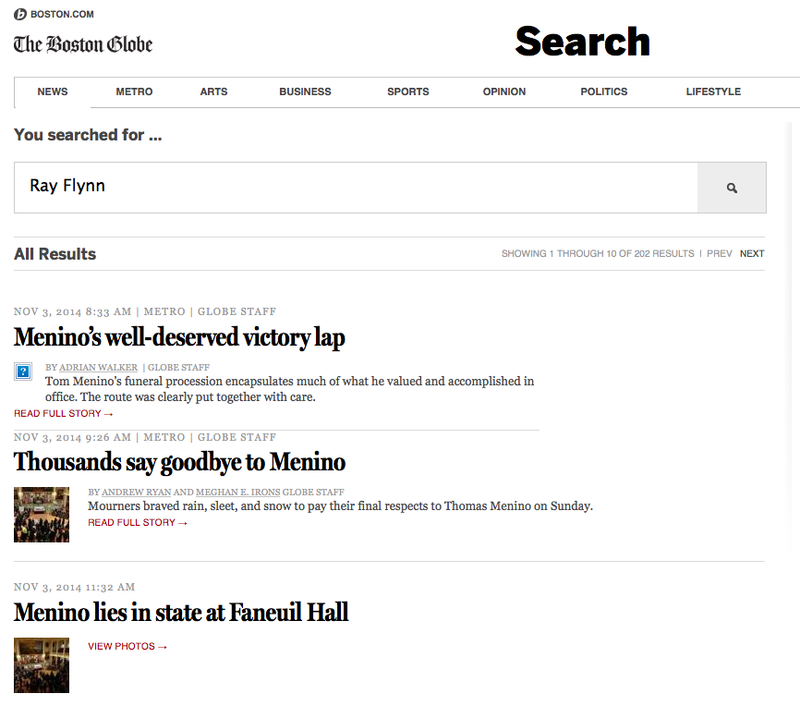 There’s also a tsk-tsk from former Boston mayor/current Herald contributor Ray Flynn, but it’s not worth repeating. What is worth repeating: Boston.com needs some serious adult supervision. 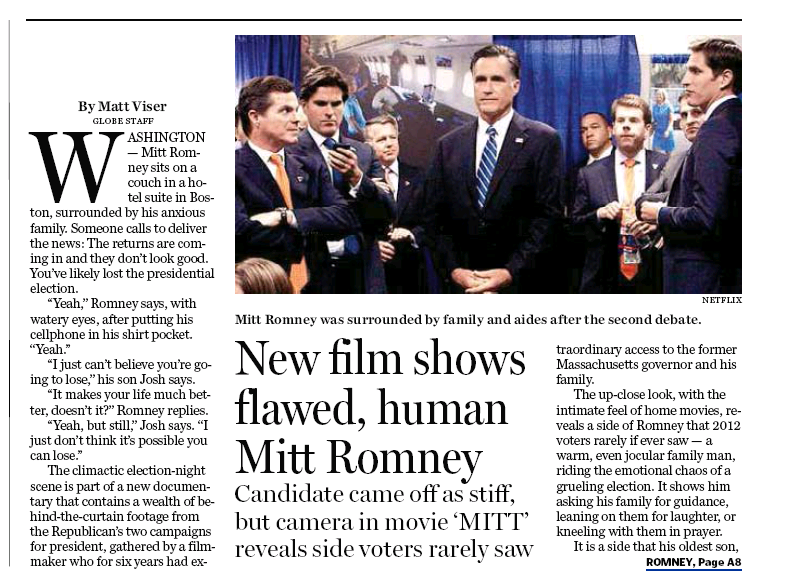 Either that, or the Boston Globe should tear the sheets with Buston.com. 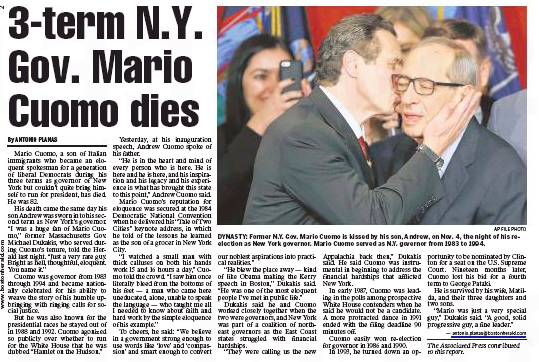 Mario Cuomo spoke in poetry, but lived in prose. Exhibit A: His Hamlet on the Hudson forever fluttering. 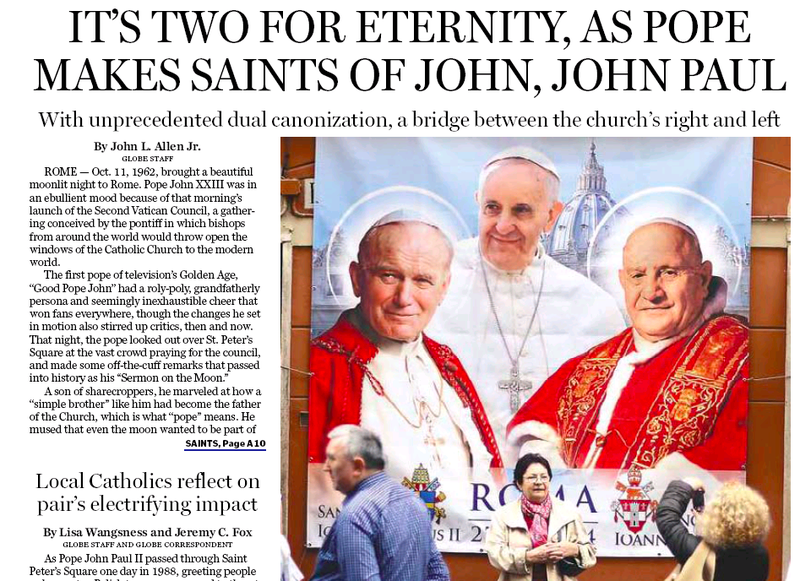 Maybe that’s why the local dailies didn’t bother to compose their own obituaries of the former New York governor, but cherry-picked them from other news outlets. 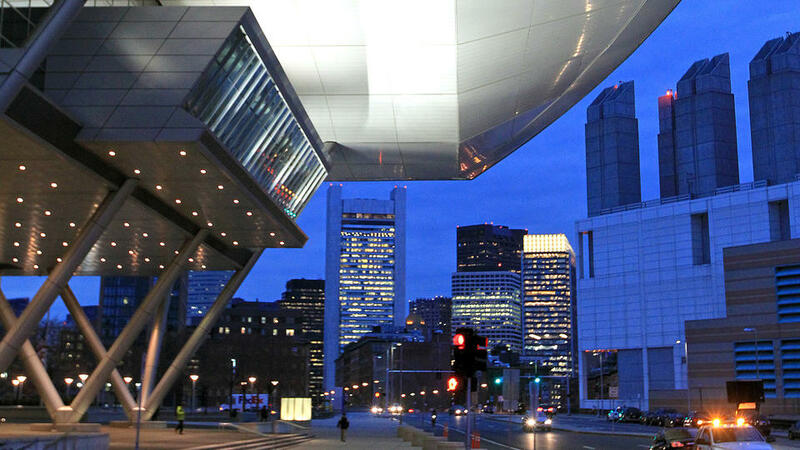 The Boston Globe, on the one hand, plunked the New York Times obit on its front page. 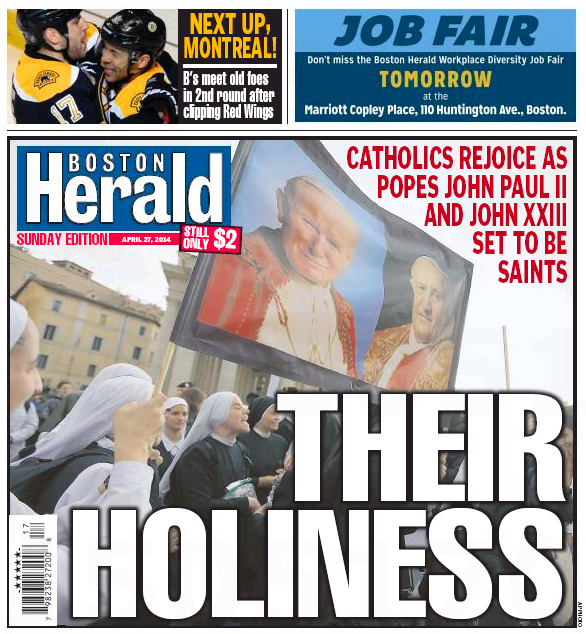 The Boston Herald, on the other hand, plucked the Associated Press. 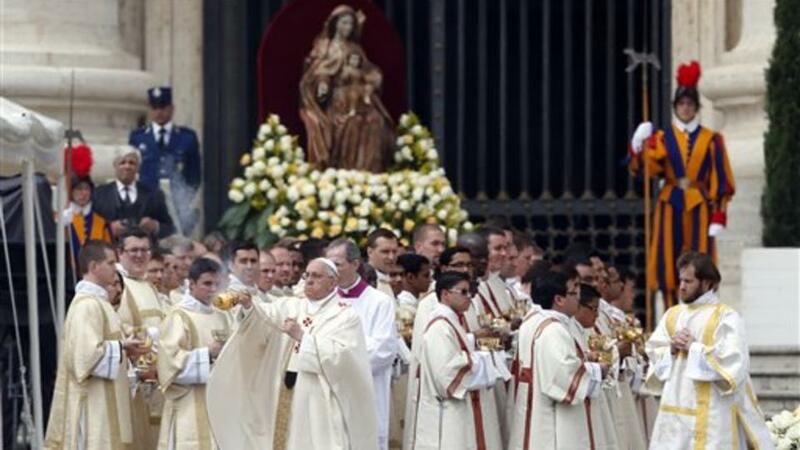 Hey – that’s show biz. 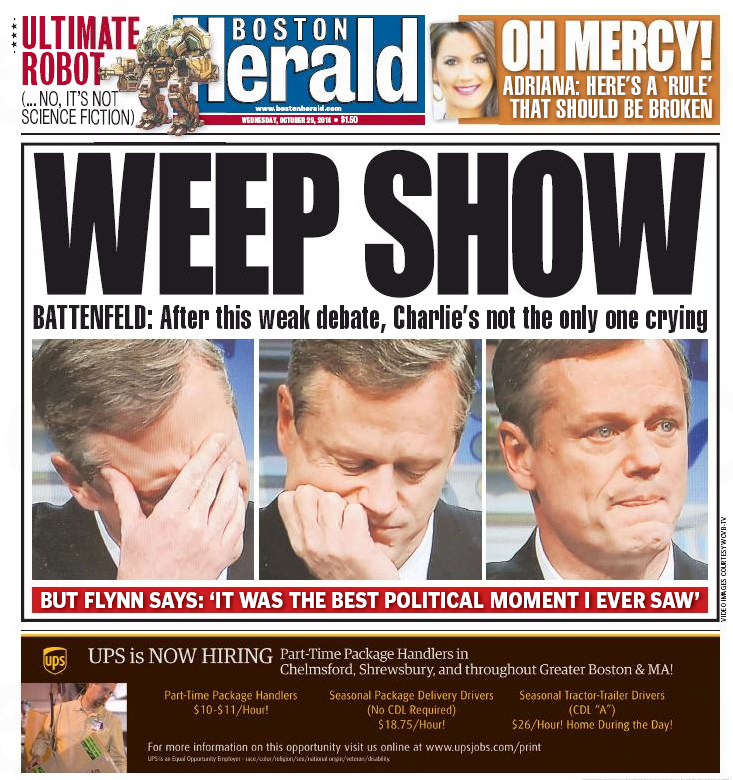 Republican gubernatorial wannabe (Two-Time) Charlie Baker may have turned on the waterworks in last night’s debate with Democratic gubernatorial wannabe Martha Coakley, but today’s Boston Herald turned the firehose on. 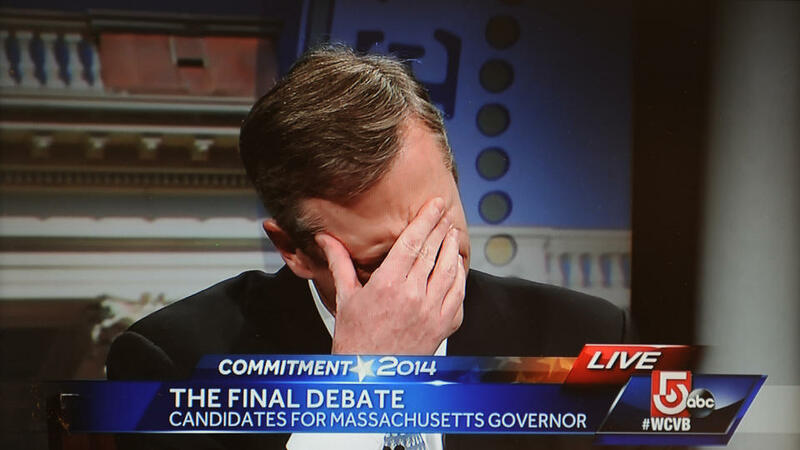 Forget about Charlie Baker crying. The ones who should be crying are the voters. Would you rather win the Lottery or the election? What’s your signature dish in the kitchen? What’s the best Halloween costume for your opponent? 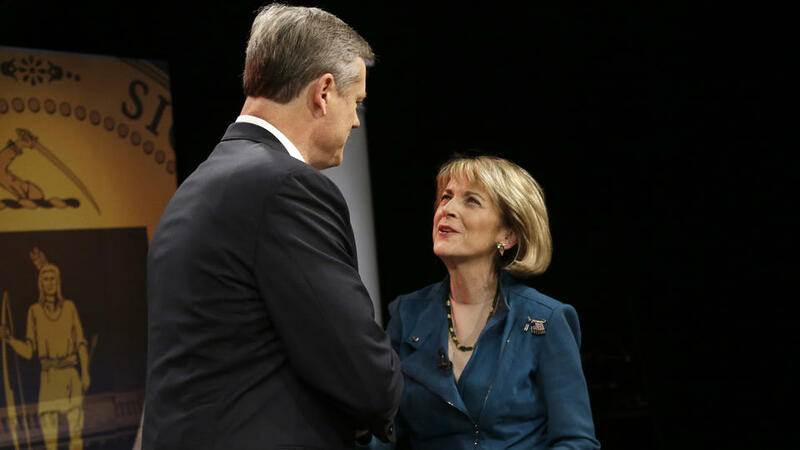 Those were actual questions in a debate that will be the last time most voters see Baker and Democrat Martha Coakley in a televised, face-to-face confrontation. Baker’s cry will get the most attention in this bizarre debate showdown. 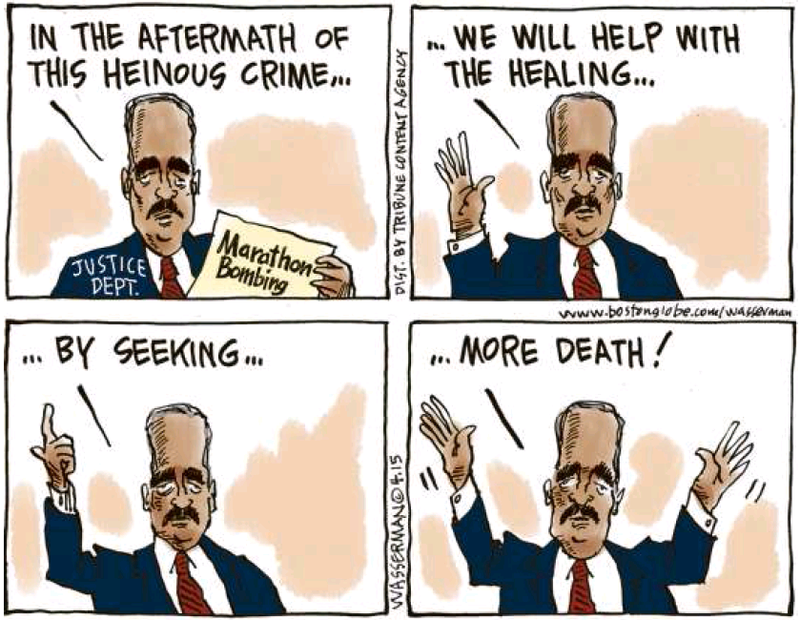 And that’s not a bad thing for a Republican accused of being a heartless budget cutter. Baker’s cry did not look contrived — he looked like a dad watching the last scene of “Field of Dreams.” And it certainly won’t hurt him among the most important voters in this race — women. 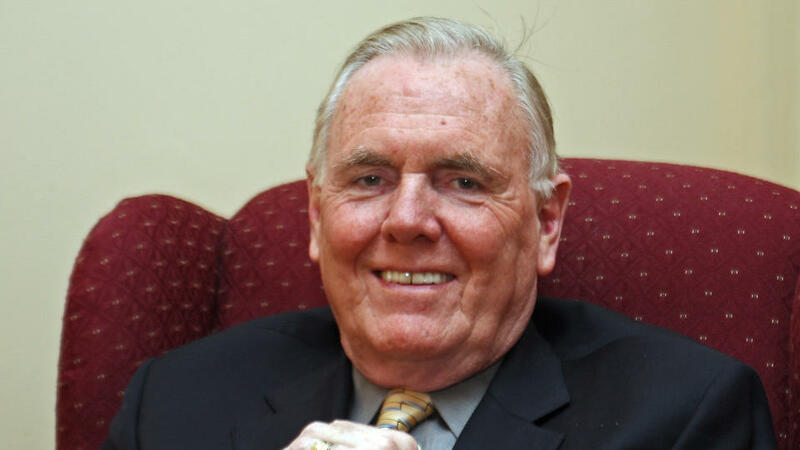 Former Boston mayor and current chinstroker Ray Flynn went even further. The real winners of last night’s final gubernatorial debate were … the voters. Both Charlie Baker and Martha Coakley gave real insight into their character and heart. 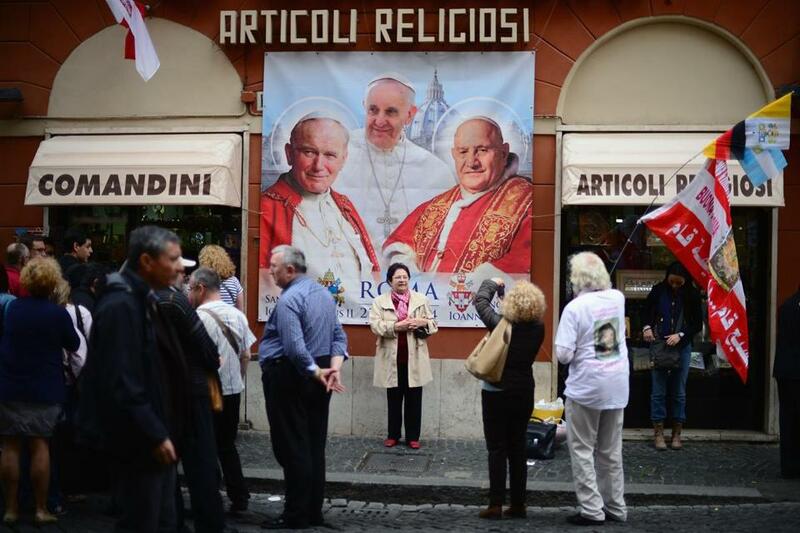 It was the best political moment I ever saw. They proved that politics is not about hate and division, but about decency and love. 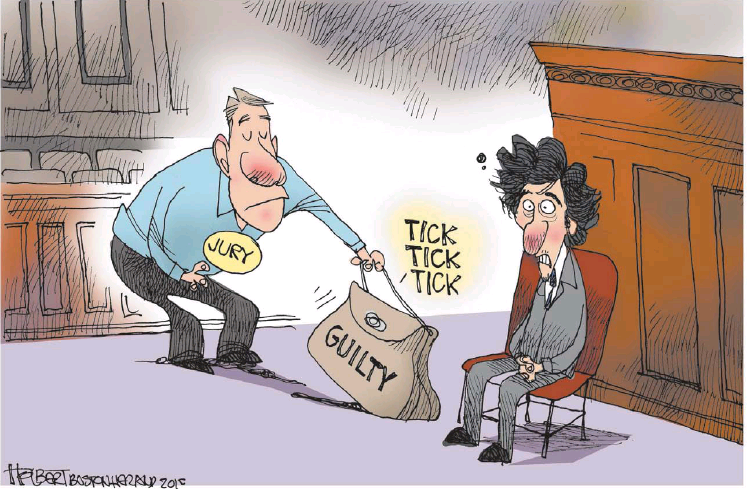 Call it naive on my part, but last night’s showdown was the best example of what government should be about. When a teary-eyed Charlie Baker told the story of a beleaguered New Bedford fisherman and his two sons trying to keep the family business from going under because of the burden of federal fishing regulations, I could identify with that hard-working father, and it reminded me of why elections are so important. Yeah, except if the family business couldn’t support the old man, how was it gonna support the three of them? We were confused. But we did mist up a bit.